With the overwhelming popularity of breweries/gastro pubs popping up in friendly areas, Eureka!, in downtown Mountain View is a serous must visit place for brew nerds, whiskey enthusiasts and specialty cocktail fans alike. Eureka!’s effortless location on Castro Street makes it impossible not to wander inside and admire it’s modern rustic style setting. Did we mention that the food is mouth watering? Not sure how to start this review but Heck, let’s get down to the real review, shall we? Rustic style gastro pub is very inviting with its open concept with warm hosts and staff. Located right in the middle of downtown Mountain View, it’s a serious gastro pub contender in Google town. Nothing beats live music. It’s awesome; this place sets the mood for the buzz just right. Reminds me a lot of Austin. Don’t forget to look at the wall list of brews next to the bar area, they list what’s on tap. Food selection is great, we had a chance to try a good amount of their menu, Here are my list of favorites: Chicken wings, Bone marrow burger, Jalapeño Egg Burger, and olive roasted scallops. Their Burger patties are vegan fed, it’s rich in flavor but not as Rich as K-Fed after divorcing Britney though. Keep in mind, it’s the bomb dot com. They cater their beer selection geographically to help support small local breweries. Their beer line up is hard at work too. Each beer gets performance reviews so don’t hesitate to ask their friendly staff about reviews. Just like Eureka’s approach on supporting geographical proximity of breweries, they also work with small/local whiskey distilleries. It’s a full-blown brown bar. They have Bourbon, Rye, Single Malt, Corn, and wheat. Holy Smokes! – my favorite because its in a ball glass with smoke in it. I think this should be their signature drink if it isn’t. 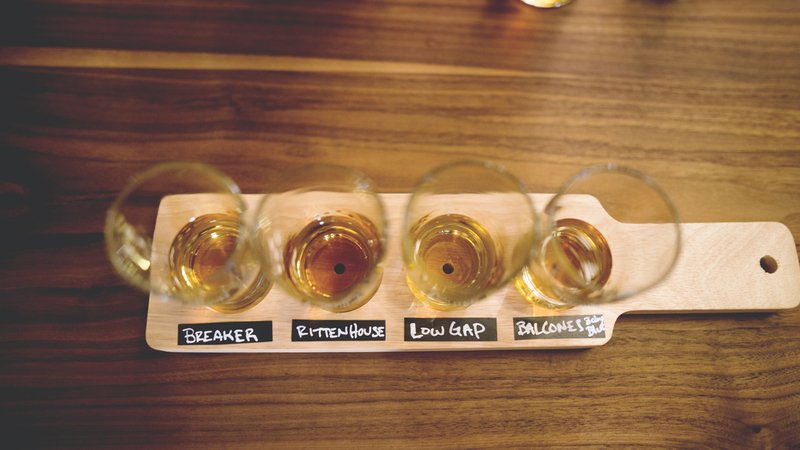 Whiskey Flight – from Tyler’s favorites (see photo) this line up did not disappoint. As Will Ferrell said on Starkey and Hutch, "Oh Eureka, thats nice" is the best way to describe this place (without the Ferrell creepiness). This place is amazing and we cannot wait to come back. I can’t stop raving about the hip-ness of this place and it sure will be the one of the hottest hangouts in Google town. We couldn’t thank the team enough for their hospitality, Alexia (PR and Marketing), Tyler (Beverage Director), and Daniel (regional operations manager) for taking care of us. You guys made our experience nothing but exceptional.